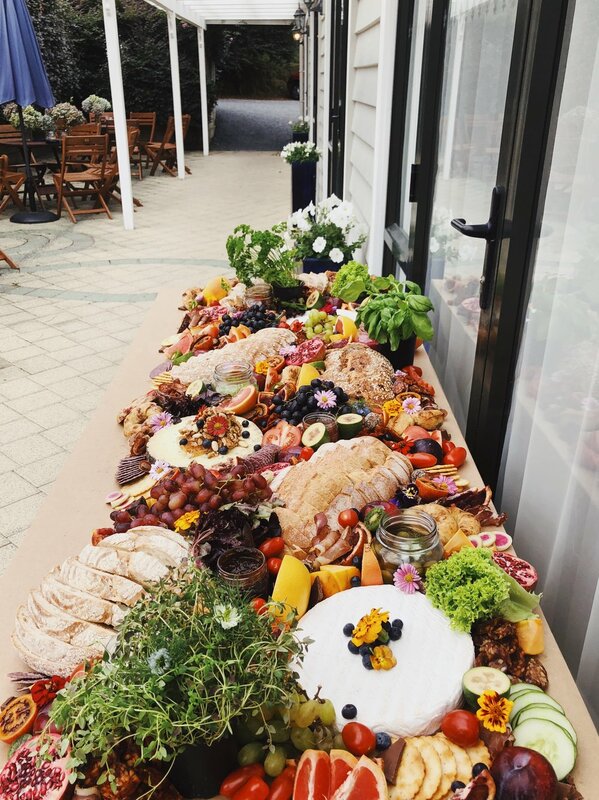 The reason we use a per head price when catering for larger groups is to ensure there will be enough food to not only keep your guests going throughout the event, but also to make sure the table itself looks beautiful and full of life and colour. Grazing tables are designed as just that, grazing. They will help keep your guests full throughout the night and accompany a light meal perfectly. Want to see more? Head to our GALLERY! To create a table with levels, foliage/flowers, different platter boards and textures. Table and accessory hire is required. This is a standard $80 charge (Waihi - Papamoa. Additional charges do apply out of this area to cover return petrol to pick up items. ) Please select this when enquiring. Please view our food safety terms here before enquiring. Thank you! How exciting, I promise I'll get back to you as soon as possible! I hope we're grazing together soon! We arrive 2 hours before show time, set up in your designated spot and leave to allow you to enjoy the evening and your graze. A ten percent non-refundable deposit will be required to hold your date, you will have five working days to pay this deposit until your date is opened up to the public again. One month out from your wedding date, the remainder of your payment is due. All info can be found in our terms and conditions here. Please note, if your invoice is not paid by the due date your date will be passed on to the waiting list. This is to ensure everyone gets an equal chance to book for their event. A contract will be sent out with your deposit invoice. This is required to be signed. When it comes to weddings and events, our grazing tables are the perfect option to add colour, delicious fresh produce and the finest meats, cheeses and breads to your event! The same love and care goes into each grazing table that we create. So you can be assured you'll always feel The Honest Platter love, no matter the event or purpose. We've heard the phrase 'wedding tax' being thrown around a lot in the industry and we want to assure you that there is no such thing here, we treat every event with the same care and honour as any other!